A FES bridges the gap between home and school by assisting parents in understanding ways they can help their children with academics. Need support or information on how to improve your child's academic performance in school? Please contact Mrs. Jordan (618-0287) for assistance. 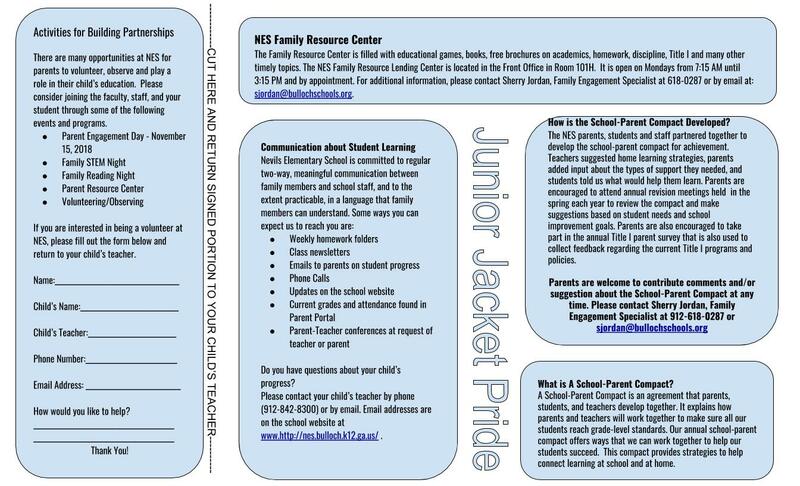 NES Family Engagement Program Needs Your Feedback! 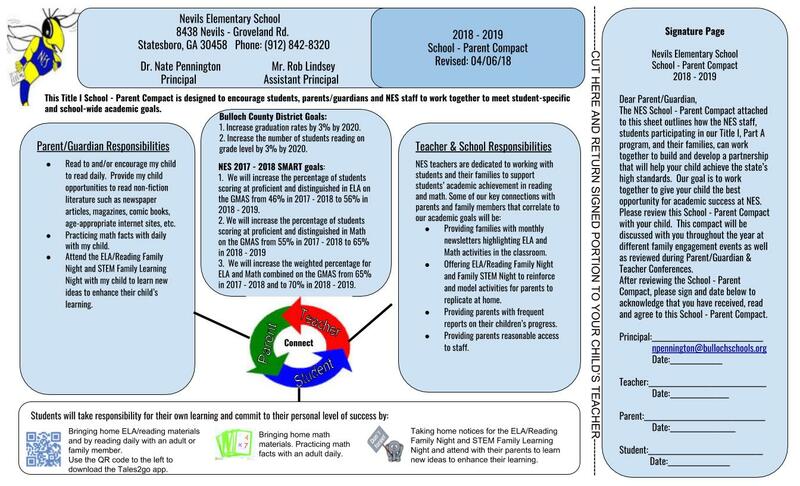 Below are the links for the NES 2018 - 2019 Parent & Family Engagement Plan (FEP) and the 2018 - 2019 School - Parent Compact. If you have questions or would like a hard copy of the documents, please contact Sherry Jordan, Family Engagement Specialist at (912)618-0287 or sjordan@bullochschools.org. Comments and suggestions for the 2019 - 2020 FEP & Compact are always welcome! Please send those to Marlin Baker, Principal at mbaker@bullochschools.org or Sherry Jordan,FES at sjordan@bullochschools.org. Recipes for Success has lots of fun educational activities that you can do with your child at home or on the go. Please see the links below or call me @ 912-618-0287 to request a paper copy. What is a Parent & Family Resource Center? - It's an inviting space for adults to use. - The Parent & Family Resource Center is available to parents, families, and teachers of Nevils Elementary School students. What can I expect to find in the Parent & Family Resource Center? - A variety of educational games, activities, workbooks and homework tips. - Free brochures and pamphlets that address a wide range of family and educational topics. - A word processor and printer for writing letters, resumes, and etc. Who can help me in the Parent & Family Resource Center? - I will be happy to help. If you would like an appointment please call. When may I use the Parent & Family Resource Center? - The Parent & Family Resource Center is open during school hours on Mondays. - Special arrangements may be made if the Parent & Family Resource Center is needed at other times. Please call me for an appointment. Where is the Parent & Family Resource Center located? - The Parent & Family Resource Center is located in the Media Center. After entering the Media Center door, the Parent & Family Resource Center Cabinet can be found on the left. If you have any questions, concerns or suggestions for the Parent & Family Resource Center, please let me know. I look forward to hearing from you!